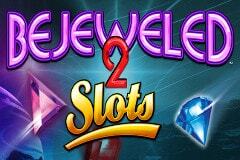 Prepare to be dazzled by bright and colourful gems that fall onto the reels in this popular video slot from Blueprint Gaming that is based on the tile-matching game titled ‘Bejeweled’ which has taken the puzzle-solving community by storm and been downloaded several hundred million times since released by PopCap Games back in 2001. This is just one of many video slots to be released under the collaboration between PopCap Games and Blueprint Gaming as we have previously reviewed fellow tile-matching slot game Chuzzle and the Peggle slot amongst several others. Just as the original game proved to be so popular and addicting that five sequels were released, Blueprint Gaming have also released a sequel to this slot titled Bejeweled Cascades to provide you with even more jewel-themed entertainment. Fans of Bejeweled will be pleased to hear that the video slot sticks as closely to the gameplay, visuals and sounds of the game as possible with majestic sound effects accompanying the gems dropping onto the reels as you set off on a quest to match as many tiles as possible. Of course, it wouldn’t be a Blueprint Gaming slot machine without wonderful bonus features to enjoy so on this 5-reeled slot with 20 adjustable paylines you can enjoy the Bejeweled Bonus where you’ll actually play the game hoping to land three-in-a-row combinations, a fantastic free spins mode where you can receive up to 50 free spins along with a multiplier bonus, and you could also gain the opportunity to spin the Wheel of Riches for a cash multiplier of your stake! While matching three was the aim of the game in the puzzle game, on the slot reels you’ll be aiming to match five on a payline as this is how you’ll reap the largest wins of all while spinning the reels. It’s the vibrant swirling gem which acts as the Wild symbol here with it having the power to substitute for all other symbols aside from the three Scatters which trigger their respective bonus games, plus it is the most valuable of all as it offers rewards of up to 500x your stake. Other gems include a red ruby and blue sapphire worth up to 37.5x your stake, a green emerald worth up to 20x your stake, with Ace to 9 icons completing the line-up and these have also been design in the style of gems. You’ll have the opportunity to experience a game of Bejeweled with the Cascading Reaction Bonus once you land three or more of the Scatter symbols on the reels at the same time. This sees you transferred to another screen where you are presented with the original Bejeweled board with a dazzling array of gems already filling it. This will include one matching set which will explode before your eyes before more gems will fall into the gaps and hopefully cause more explosions as this means you’ve won again. While you may not get to select gems to shift around like the original game, it’s still very exciting and you’ll be looking out for two very special gems that can appear – a Powergem and a Hypercube. The Powergem doubles any win it features in and destroys gems surrounding it while the Hypercube appearing will see gems of one colour destroyed for a mystery win before their positions are filled again. Three, four or five of the Free Spins Scatter symbols will see you scoop 15, 25 or 50 free spins respectively, but before the reels start spinning at no cost you will have to play a mini-game to determine a multiplier bonus which will be applied to all of your winnings. This ranges in value from 2x to 7x and to top it all off, it’s even possible to retrigger the feature! Up to 500x your stake is on offer should you earn the opportunity to spin the Wheel of Riches but to do so you’ll first have to land three or more of the Wheel Scatter symbols during the same spin. A spinning wheel will then be displayed which rotates at a furious pace before eventually coming to a halt as a multiplier bonus is revealed. This multiplier value is then multiplied with your total stake and awarded to you as a cash prize – trust me when I say it rarely disappoints! Fans of Bejeweled will be ecstatic to see the classic game recreated on the reels with its authenticity transferred flawlessly. Just as the tile-matching game proved to be so addictive, you could well find yourself hooked on matching gems on the reels due to the rewards on offer in the bonus games!